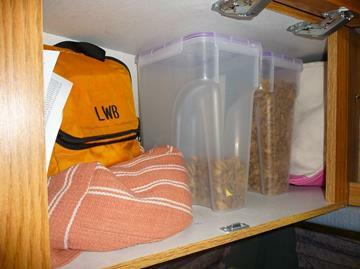 In our thoughts about living in a small RV, we talked about the importance of organization and storage. It is very important that everything has a “put away” place. Get rid of clutter! A Class B is much too small to allow clutter. It will take a little while to figure out what works best for you. But to get you started we will show you what is working well for us. It may give you some good ideas for your rig. Of course we may change things too if we find better ways. Kitchen Storage. All the kitchen storage information in the Kitchen section. Bathroom Storage. All the bath storage information is in the Bathroom section. Outside Storage. All the outside storage information is in the Exterior section. Floor Level Storage. 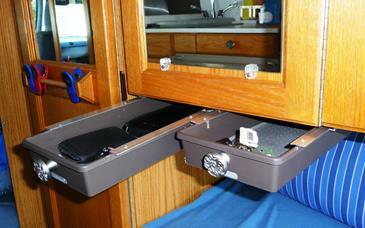 Roadtrek designed lots of storage into our 190 Popular. The diagram to the right shows Red Rover’s available storage (varies with year and model of Roadtrek). 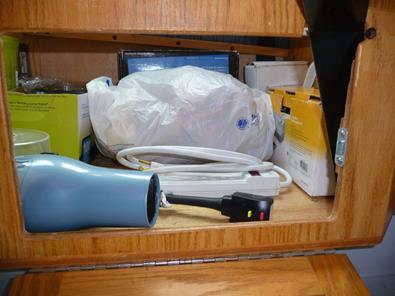 Under the dinette seats are various appliances – the generator, converter, water heater, furnace and the battery in a vented compartment. But additionally there are 3 general storage areas. 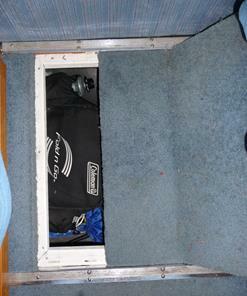 And there is the underfloor “trunk” that appeared in the pre-mid-1996 Dodge Roadtreks. Under the third passenger seat is a huge storage area that can contain large objects if the seat bottom is lifted up. Storage 1 & 3. Storage 1 is for his stuff - shoes, shower bag, and whatever. 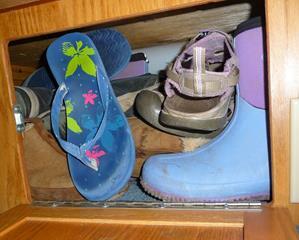 Storage 3 is for her shoes, boots, flip-flops and sandals. Storage 2. 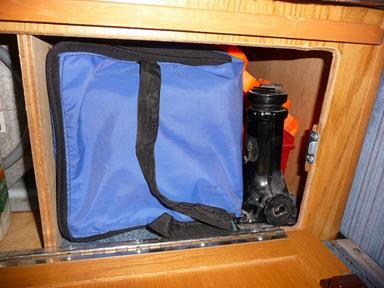 Storage 2 is just inside the rear door and shares a door with the water heater. It has at the front the bottle jack and the Lynx leveling blocks. To the rear are some safety triangles, a tool kit in a plastic case, and a tool bag that contains the infrequently used tools (soldering iron, wire connector, hammer, wrenches, etc). Underfloor Trunk. Just inside the rear door is folding door access to the “trunk”. Inside we have a soft side cooler, a screen room, a tarp, and two SilverShade mesh tarps, the Coleman Fold-N-Go grill and some seldom needed items. Storage 4. 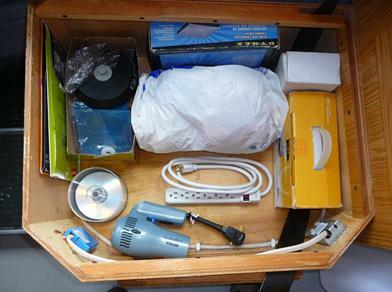 Under the third seat has a power strip extension cord and hair dryer, but other contents vary with the plans for the trip. 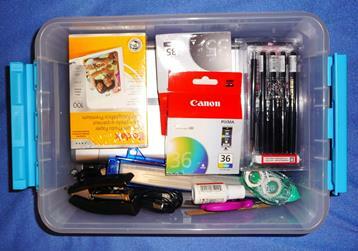 As I write this it contains supplies for the event we just attended. This is the view from the door that opens to the aisle. This is the view from above. 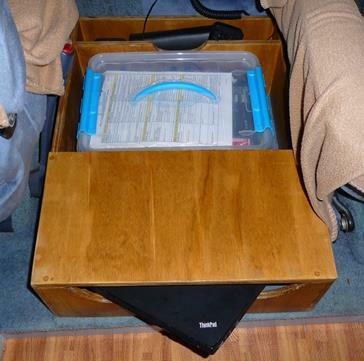 One wonderful feature of this space is that the seat bottom can be lifted away to store large items under the third seat. Later models of Roadtrek have a drawer under the seat. This is handy but is does cut down on the storage volume. We are happy we can use the whole compartment. 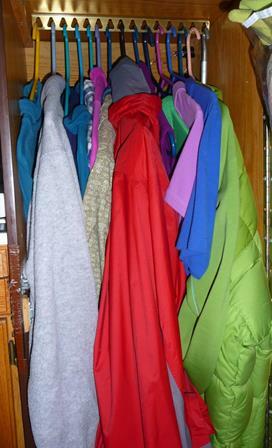 Clothes Closet. 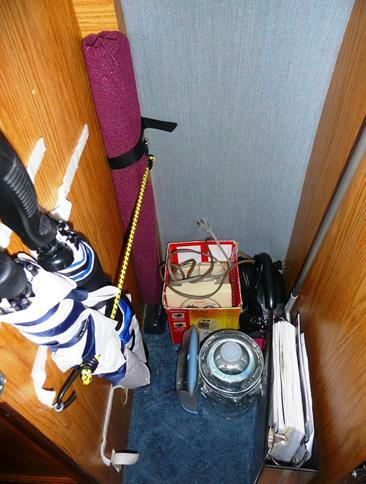 The closet contains the hanging clothes, but also at the bottom, a notebook of manuals and important Roadtrek info, two golf umbrellas, the table legs when not in use, the crank for the awning, a small electric heater, the Pet Hair Eraser portable vacuum, and a gallon or two of drinking water. 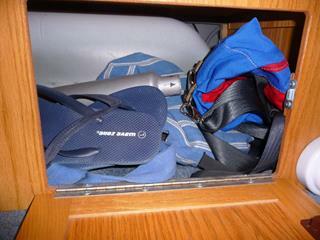 A pocket on the back of the door holds gloves and hats for cold weather and two mosquito hats as well. The bungee cord keeps the umbrellas and table legs out of the way of the clothes. Best RV Trick. 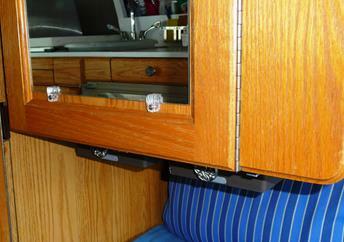 Someone on the Yahoo Roadtrek List passed on the best trick for RV closets. Put the hangers in with the open side toward the door. No more struggling to get the hangers in or out. 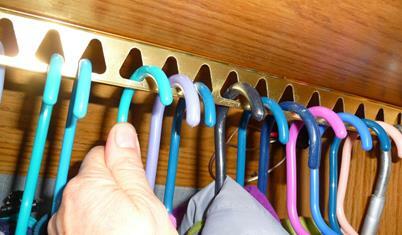 Or finding special hangers. Or cutting off the tip. Duh! Now why didn’t I think of that? Clothes Storage. 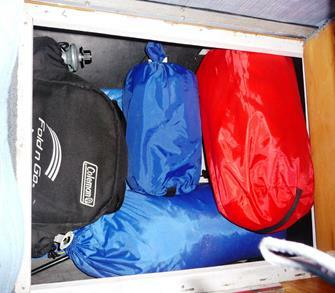 We learned from our bicycle camping days that rolling clothes is an efficient way to store them. So we made cubby holes (with Masonite, and slots cut halfway) for rolled clothes in the cupboard next to the bathroom. 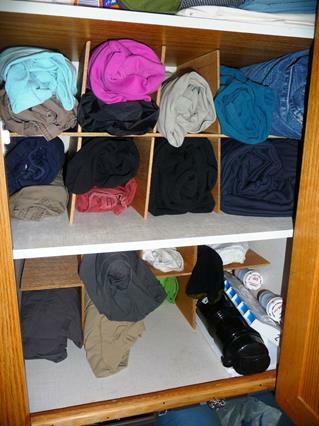 For long sleeve shirts, two will fit in a cubby hole and for T-shirts, three will fit. Two pairs of shorts or one pair of long pants per cubby hole. One shelf for her and one for him. Unless wide weather swings are expected this plus the hanging closets has been plenty of room for up to a 5 week trip. We plan on washing clothes about once a week. 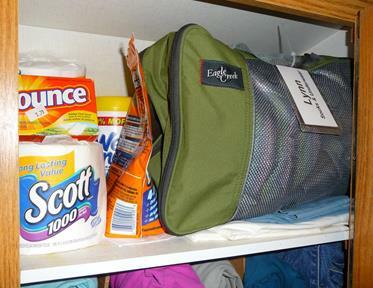 The top shelf in the cupboard has pillowcases, Eagle Creek double sided bag with underwear & socks, extra toilet paper, laundry soap and dryer sheets. Long Compartments by Air Conditioner. 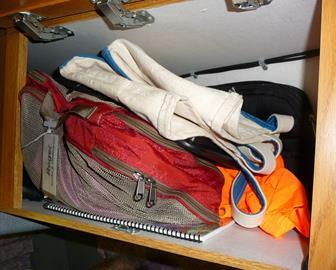 Although we have a His and a Her side, there some general items in these compartments. His side has the DVDs and bike helmets, and her side has the dog food. Extra clothes or reading materials ends up here as well. Odds and Ends. One problem we ran into is every night the kitchen counter or stove top would get stuff from our pockets dumped on it. Keys, wallet, change, and other miscellaneous stuff would clutter the coach. We needed a good place for such stuff. After some thought we decided under the clothes cupboard was the perfect spot. 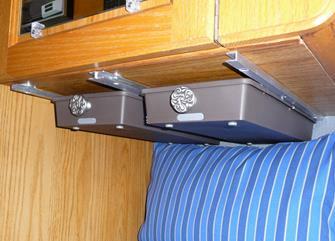 These drawers are essentially invisible to the casual observer. And we each have one for our stuff! Office Supplies. It seems that office supplies of some sort are a necessity in this computer age. Our “computer box” described on the Electronics page stores our office supplies in a plastic box. 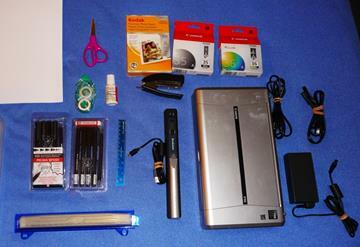 The box contains a small inkjet printer (a Canon), a hand scanner (Brookstone), extra ink, drawing pens, scissors, ruler, stapler, 3-hole punch, white-out, adhesive strip, and both photo and regular paper. This seems to cover what we have needed on the road.